With the 25th Infantry Div. 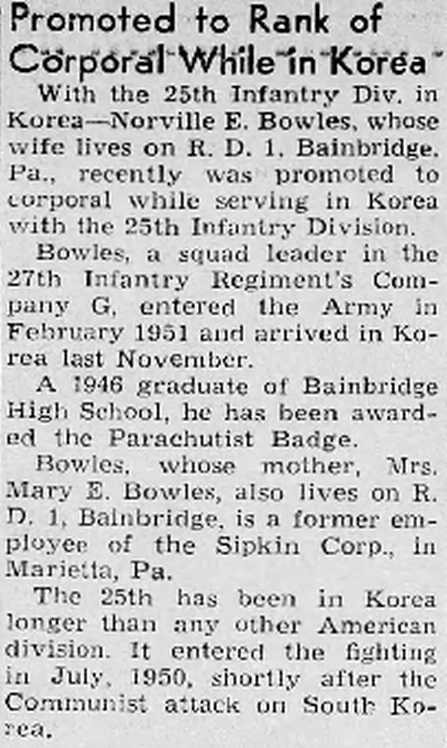 in Korea Norville E. Bowles, whose wife lives on R. D. 1, Bainbridge, Pa., recently was promoted to corporal while serving in Korea with the 25th Infantry Division. Bowles, a squad leader in the 27th Infantry Regiment's Company G, entered the Army in February 1951 and arrived in Korea last November. A 1946 graduate of Bainbridge High School, he has been awarded the Parachutist Badge. Bowles, whose mother, Mrs. Mary E. Bowles, also lives on R. D. 1, Bainbridge, is a former employee of the Sipkin Corp., in Marietta, Pa. The 25th has been in Korea longer than any other American division. It entered the fighting in July, 1950, shortly after the Communist attack on South Korea. Army Sergeant John M. Aicholtz, 22, son of Mrs. Anne Aicholtz, 5520 Hopewell, Church Road, Lancaster, was one of more than 800 paratroopers of the 82nd Airborne Division at Ft. Bragg, N.C., who participated in Exercise Freedom Vault in the Republic of Korea, March 3-6. The exercise, held jointly with South Korean forces, was designed to demonstrate the capability to rapidly deploy U.S. Strike Command Units from this country to an overseas area for immediate tactical operations. The Airborne troops were flown on the 8,500 mile polar route journey by transport aircraft of the U.S. Air Force. Highlighting the exercise was a parachute assault into the simulated combat zone well south of the Korean demilitarized zone. Freedom Vault was the second exercise of its type to be held in the Republic of Korea. Paratroopers of the 82nd also jumped there during exercise Focus Retina in March 1969. Sgt. Aicholtz is a fire team leader in Company C, 2nd Battalion of the Division's 508th Infantry. He holds the Silver Star, Bronze Star Medal for Heroism, Army Commendation Medal for Heroism and the Purple Heart. His wife, Judith, lives at 5523 Marcia St.. Fayetteville, N.C.
Spec. 4 Robert L. Chatman, 20, son of Mr. and Daniel L. Chatman of 325 St., High Point, was one more than 800 paratroopers of the 82nd Airborne Division at Ft. Bragg, who participated in Exercise Freedom Vault in the Republic of Korea in early March. The exercise, held jointly with South Korean forces, was to demonstrate the capability to rapidly deploy U.S. Strike Command units from this country to an overseas area for immediate tactical operations. The Airborne troops were flown on the 8,500 mile polar route journey by transport aircraft of the U. S. Force. Highlighting the exercise was a parachute assault into the simulated co m b a t zone of the K o r e a zone. Freedom Vault was the second exercise of its type to be in the Republic of Korea. Paratroopers of the 82nd also jumped there during Exercise Focus Retina in March 1969. Chatman is a grenadier in Company C, 2nd Battalion of the Division's 508th Infantry.